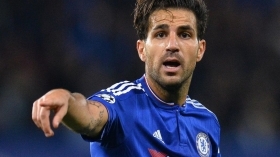 Chelsea manager Maurizio Sarri has said that midfielder Cesc Fabregas needs to pursue a fresh challenge elsewhere after the club failed to meet his contractual requirements. The Spain international's current deal with the Blues expires at the end of the season and it is understood that the club have offered him a year's renewal which he has snubbed. Amidst this, reports have indicated that the midfielder is on the verge of joining AS Monaco and Sarri has hinted that is very much the case with a three-year contract on the table from an overseas club. "In my opinion, he needs to go. You know very well the situation. You know very well in this club there is a rule: the renewal of players over 30 is usually one year. He has an offer for three years," he told Chelsea's official website. Fabregas was struggling with a minor calf injury during the final stages of the 2-0 FA Cup triumph over Nottingham Forest and Sarri has given no assurances that the midfielder will make the matchday squad.